Blood – Blood Vessels, Body Fluids and Circulation: Plasma, Formed Elements: Red Blood Cells (RBC), White Blood Cells (WBC), Platelets, Coagulation of Blood, Blood Groups. It transports substances like digested food from the small intestine to the other parts of the body. It carries oxygen from the lungs to the cells of the body. It also transports waste for removal from the body. Blood is a liquid, which has cells of various kinds suspended in it. The fluid part of the blood is called plasma. One type of cells are the red blood cells (RBC) which contain a red pigment called haemoglobin. Haemoglobin bind with oxygen and transports it to all the parts of the body and ultimately to all the cells. The presence of haemoglobin makes blood appear red. The blood also has white blood cells (WBC) which fight against germs that may enter our body. The clot is formed because of the presence of another type of cells in the blood, called platelets. They are two types of blood vessels namely arteries and veins. Veins are the blood vessels that carry carbon dioxide-rich blood [impure blood] from all parts of the body back to the heart. Pulmonary vein is an exception as it carries oxygen-rich blood [pure blood] from lungs to heart. The veins have thin walls. Arteries are the blood vessels that carry oxygen-rich blood from heart to all parts of the body. Pulmonary artery is an exception as it carries carbon dioxide-rich blood from heart to lungs. The arteries have thick walls as the pressure acting on then is high. Arteries divide into smaller vessels. On reaching the tissues, they divide further into extremely thin tubes called capillaries. The capillaries join up to form veins which empty into the heart. Fibrinogen, globulins and albumins are the major proteins. Albumins help in osmotic balance. Plasma also contains small amounts of minerals like Na+, Ca++, Mg++, HCO3-, Cl-, etc. Glucose, amino acids, lipids, etc., are also present in the plasma as they are always in transit in the body. Factors for coagulation or clotting of blood are also present in the plasma in an inactive form. Plasma without the clotting factors is called serum. Erythrocytes or red blood cells (RBC) are the most abundant of all the cells in blood. A healthy adult man has, on an average, 5 million to 5.5 million of RBCs mm-3 of blood. RBCs are formed in the red bone marrow in the adults. RBCs are devoid of nucleus in most of the mammals and are biconcave in shape. They have a red coloured, iron containing complex protein called haemoglobin, hence the colour and name of these cells. RBCs have an average life span of 120 days after which they are destroyed in the spleen (graveyard of RBCs). Leucocytes are also known as white blood cells (WBC) as they are colorless due to the lack of haemoglobin. They are nucleated and are relatively lesser in number which averages 6000-8000 mm-3 of blood. Leucocytes are generally short lived. We have two main categories of WBCs – granulocytes and agranulocytes. Neutrophils are the most abundant cells (60-65 per cent) of the total WBCs and basophils are the least (0.5-1 per cent) among them. Neutrophils and monocytes (6-8 per cent) are phagocytic cells which destroy foreign organisms entering the body. Basophils secrete histamine, serotonin, heparin, etc., and are involved in inflammatory reactions. Eosinophils (2-3 per cent) resist infections and are also associated with allergic reactions. Lymphocytes (20-25 per cent) are of two major types – ‘B’ and ‘T’ forms. Both B and T lymphocytes are responsible for immune responses of the body. Platelets also called thrombocytes, are cell fragments produced from megakaryocytes (special cells in the bone marrow). Blood normally contains 1,500,00-3,500,00 platelets mm-3. Platelets can release a variety of substances most of which are involved in the coagulation or clotting of blood. Dark reddish brown scum is formed at the site of a cut or an injury over a period of time. It is a clot or coagulam formed mainly of a network of threads called fibrins in which dead and damaged formed elements of blood are trapped. Thrombins, in turn are formed from another inactive substance present in the plasma called prothrombin. An enzyme complex, thrombokinase, is required for the above reaction. This complex is formed by a series of linked enzymic reactions (cascade process) involving a number of factors present in the plasma in an inactive state. An injury or a trauma stimulates the platelets in the blood to release certain factors which activate the mechanism of coagulation. Certain factors released by the tissues at the site of injury also can initiate coagulation. Calcium ions play a very important role in clotting. As the blood passes through the capillaries in tissues, some water along with many small water soluble substances move out into the spaces between the cells of tissues leaving the larger proteins and most of the formed elements in the blood vessels. This fluid released out is called the interstitial fluid or tissue fluid. Interstitial fluid or tissue fluid has the same mineral distribution as that in plasma. Exchange of nutrients, gases, etc., between the blood and the cells always occur through this fluid. Lymph is a colourless fluid containing specialized lymphocytes which are responsible for the immune responses of the body. Lymph is also an important carrier for nutrients, hormones, etc. Fats are absorbed through lymph in the lacteals present in the intestinal villi. As you know, blood of human beings differ in certain aspects though it appears to be similar. Various types of grouping of blood has been done. Two such groupings – the ABO and Rh – are widely used all over the world. The distribution of antigens and antibodies in the four groups of blood, A, B, AB and O are given in Table below. 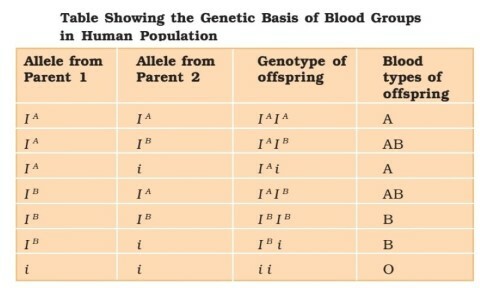 ABO blood groups are controlled by the gene I. The plasma membrane of the red blood cells has sugar polymers that protrude from its surface and the kind of sugar is controlled by the gene. The gene (I) has three alleles IA, IB and i. The alleles IA and IB produce a slightly different form of the sugar while allele i does not produce any sugar. Because humans are diploid organisms, each person possesses any two of the three I gene alleles. IA and IB are completely dominant over i, in other words when IA and i are present only IA expresses (because i does not produce any sugar), and when IB and i are present IB expresses. But when IA and IB are present together they both express their own types of sugars: this is because of co-dominance. Hence red blood cells have both A and B types of sugars. Since there are three different alleles, there are six different combinations of these three alleles that are possible, and therefore, a total of six different genotypes of the human ABO blood types. How many phenotypes are possible? You probably know that during blood transfusion, any blood cannot be used; the blood of a donor has to be carefully matched with the blood of a recipient before any blood transfusion to avoid severe problems of clumping (destruction of RBC). From the above mentioned table it is evident that group ‘O’ blood can be donated to persons with any other blood group and hence ‘O’ group individuals are called ‘universal donors’. Persons with ‘AB’ group can accept blood from persons with AB as well as the other groups of blood. Therefore, such persons are called ‘universal recipients’. A special case of Rh incompatibility (mismatching) has been observed between the Rh-ve blood of a pregnant mother with Rh+ve blood of the foetus. In such cases, the mother starts preparing antibodies against Rh antigen in her blood. This could be fatal to the foetus or could cause severe anaemia and jaundice to the baby. This condition is called erythroblastosis foetalis.